Audi Quattro concept decision soon | What Car? 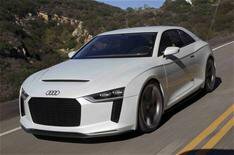 The decision on whether to turn the Audi Quattro concept into a production car will be taken this spring. The concept was unveiled at last year's Paris motor show as part of the 30th anniversary celebrations of the original Quattro. The concept is notable for being short and light at around 1340kg, thanks to extensive use of aluminium and carbonfibre rather than steel. It is powered by a 402bhp 2.5-litre turbocharged engine with 355lb ft of torque. Audi is reportedly evaluating whether to sell the car in extremely limited numbers at a very high price, or extend production and sell cars at less of a premium. However, the car's extreme light weight is likely to mean it falls into the former category.